To some people, it’s still pretty magical to hear about someone being able to work whenever they choose to. Weekdays or Weekends, Morning or night shifts, you get to choose. When people hear about this and the amount of money you could potentially make driving for Lyft, their interest might peak and provoke them into doing a little research. The truth is, the process is pretty simple and straightforward, and most people who apply to drive can usually get approved. Lyft organizes the process into simple, easy steps so you can go through the process smoothly without any hiccups. signing up only takes a few minutes, and the only real time you spend is when you go to get your vehicle inspected. This usually takes about an hour (half the time is just sitting around). Today, I’m going to explain the 7 Step Lyft driver application process to becoming a Lyft driver. The first thing you need to do before following the steps is to sign up to drive by filling out your basic information. You can fill out your information by going to Lyft’s website. The first step to becoming a Lyft driver is verifying your phone you will be using. Once you give Lyft your phone number, they will text you a 4 digit code to use to verify your phone. Input the code and hit “Verify”. Lyft will text you a code that you must input every time you login into your account. I actually like this feature because it’s an added layer of protection from people trying to hack you. Once you have verified your phone, you will be asked to input the year, make and model, how many doors, type of seats, and color of vehicle that you plan on driving on the Lyft platform. 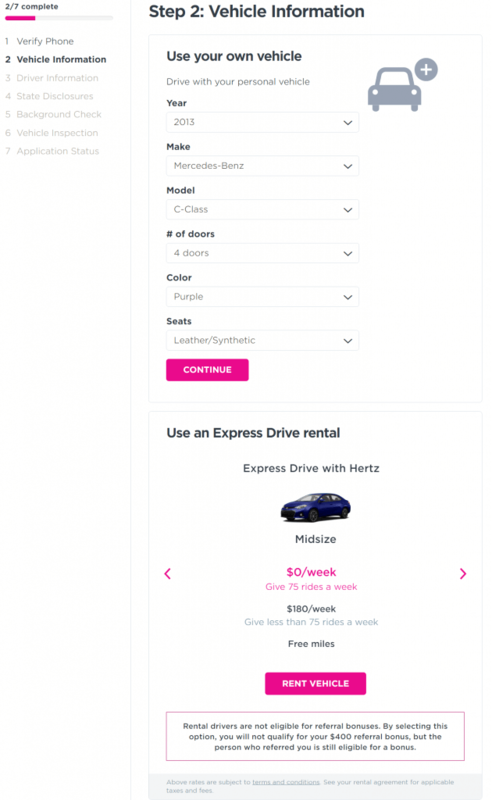 If you don’t actually have a vehicle, Lyft will allow you to use their rental program called express drive to get on the road. You pay about $180 a week, but if you drive full time and hit the ride minimum requirements usually 75 trips, you can turn your rental into a free vehicle. Express drive rental would save you money on maintenance and insurance, but you also wouldn’t qualify for many incentives. Just make sure you do your research before making a decision to rent through Lyft. Once you have entered your information hit continue. Once you input you vehicle information its time add your personal information. Lyft requires a background check in order to drive for them. 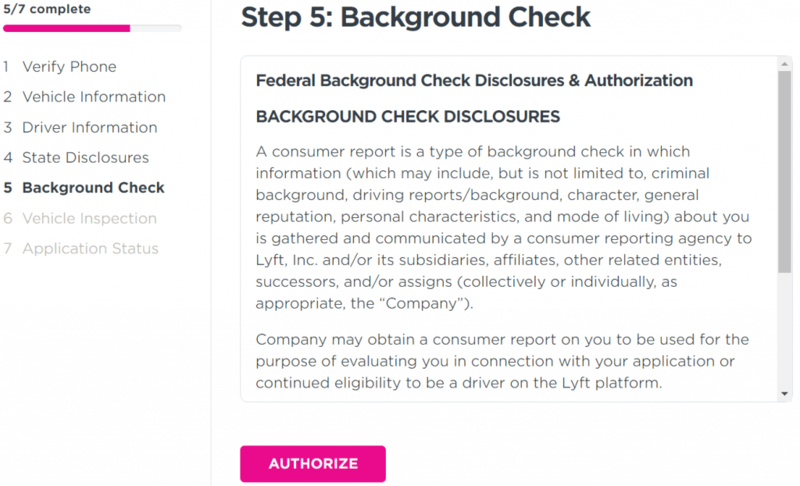 You can find out what Lyft looks for in their background check by clicking here. You won’t be allowed to drive on the platform without adding your information. Make sure everything is input exact. If you misspell your name or you’re off one number on your social security number it will become a much longer process to qualify for Lyft. Everything is secure, so you shouldn’t have to worry about your personal information becoming famous. You will also be asked to input your residential address. It’s important the address is correct because Lyft will mail you your airport placards. These are required in most states when you are picking up and dropping off passengers at airports. Lyft also ask if you have driven with another Ride share company. This doesn’t affect you. So if you drive for Uber and would rather not tell Lyft, you don’t have to. I know Lyft doesn’t need to know what I do when I’m not driving for them. Step 4 is where Lyft discloses information on your state background check and ask you to authorize the process. You’re just simply reading the information and authorizing Lyft to perform a background check at the local level. After authorizing your background check at the state level, you are asked to authorize your background check at the federal level. Not only will your criminal history be reviewed, Lyft will also perform a Driver record check to make sure you have a clean record. Now that you have input all of your vehicle and driver information, Lyft ask you to schedule an appointment to get your vehicle inspected. It’s a 19 point inspection performed by a certified mechanic. You can see the inspection form here. Lyft gives you a location to get your car inspected, but if you don’t like the location you can view “additional locations and dates” to see if there is a better location for you to get your car inspected. Once you have found a preferred date and time to get your car inspected and prepare for your appointment. 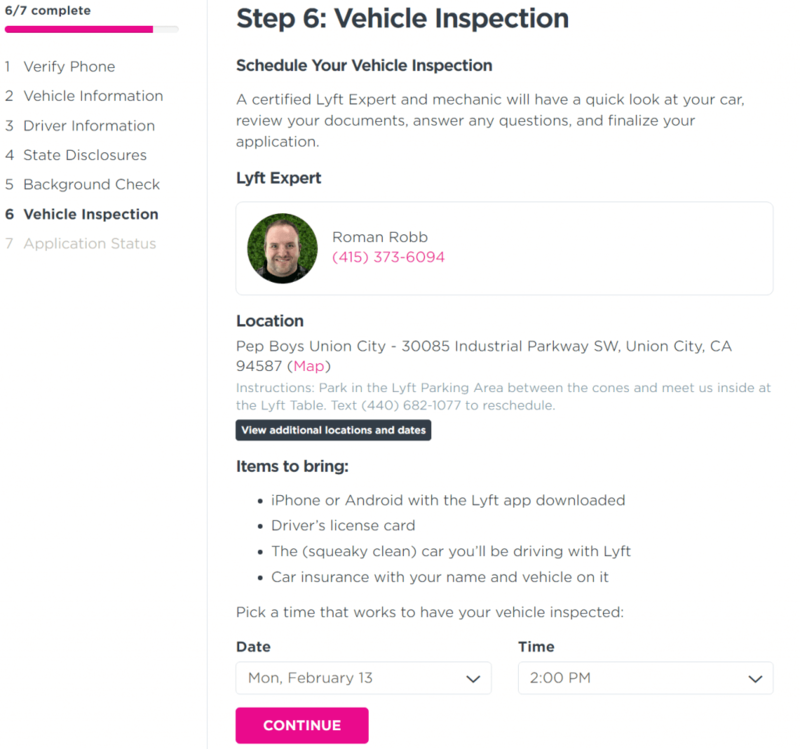 Any documents you haven’t uploaded yet Lyft will have you take care of at the vehicle inspection appointment. If you’re wondering what the car requirements are for Lyft, Check them out here. Once you have completed the first 6 steps and gotten your vehicle inspected, now you just play the waiting game. Once all your documents are uploaded, Lyft will perform your background check. It usually takes 3-5 days to be approved to drive for Lyft at this point. This means if you apply Monday and get your vehicle inspected on Tuesday. You could be approved and able to drive by the weekend. Lyft will send an email letting you know when you’ve been approved to get on the road. If it’s taking a little longer than you expected and you’re wondering if you’ve been approved, you can check your application status here. Looking from the perspective of a newbie driver, I actually liked Lyft’s inspection better than Uber’s. The requirements for Lyft are a little higher, but they also put in more effort to make sure the new drivers understand how the Lyft app works. A few hours before the inspection, I received a text message reminding me of the inspection, where to park, and the documents I needed to bring. Once I arrived, I walked into Pep Boys (this was where my inspection was) and found Lyft with their pink tent. The Lyft guy has you sign in and ask you to fill out the vehicle inspection form with your basic information. Once that was taken care of I handed him my keys to get my car inspected. As I was waiting for other drivers to sign-in, the Lyft guy sent me a link to click on to finish uploading the documents that were asked to be brought to the appointment (License, insurance, etc..). Once everyone had signed in and taken care of their documents, the Lyft guy had us huddle around a computer and watch several short videos introducing you to Lyft and explaining how driving and getting paid works. At the end of all the videos, the Lyft guy asks if you have any questions to make sure everyone will be ready when they’re approved to hit the road. By this time almost an hour had passed since my arrival, and Pep boys was finishing up all of the driver’s vehicle inspections (There were about 10 new drivers at the scheduled appointment I went to). The Lyft guy called people’s names and had you take a picture of the inspection form to finish uploading all of my documents. I was also handed a small welcome kit that contained my Lyft stickers for my windshield and rear window as well as some F.A.Q.s explaining a little bit more about Lyft. Can I Start The Application Process and Come Back? Yes, the cool thing with Lyft is once you have started the process you can exit and come back without having to re-enter your information. All you do to resume your progress is enter your phone number you used and then verify your phone with the code Lyft will text you. If you’ve already signed up, you can resume your application here. How Do I get A Sign-Up Bonus When Applying To Drive For Lyft? In order to receive a sign-up bonus, you must use an existing driver’s referral code. If you haven’t signed up for Lyft yet, you can use my referral link here. The promo code is automatically applied. You just need to fill out your information and go through the application process. Will I Pass The Background Check and Car Requirements to Drive? For the most part, any ordinary person that has a fairly clean driving record and no criminal history should be able to pass the requirements pretty easily. 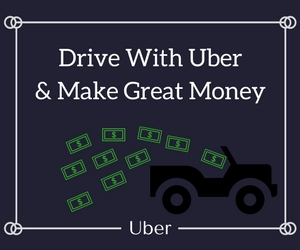 If you are wondering what Lyft looks for and want to make sure you will pass the Driver requirements, you can check out my in-depth article about Lyft’s driver and vehicle requirements. Have questions I didn’t answer? Ask away in the comments sections. After I get approved now long can I wait to start driving? I received the confirmation that I passed everything and am ready to drive, but I don’t have my placard. Do you know where I can get it? Can i apply even if the car and the insurance is registered under my wife? Thank you , this feed is really informative.